The subject underwent daily fMRI scans, and procedures to evoke brain activity. She didn’t take any medications, and suffered three migraine attacks during the 31-day experimental period. 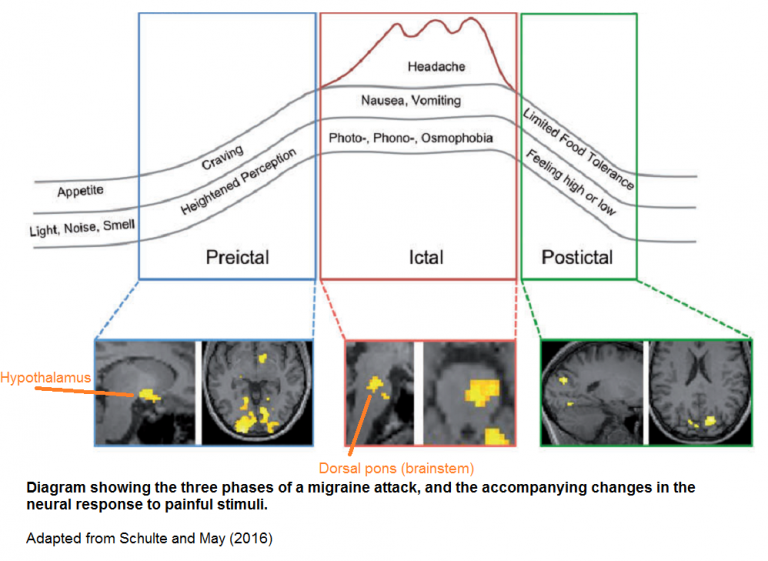 “The dorsal pons has previously been found to be hyperactive during migraine. It’s been dubbed the brain’s ‘migraine generator.’ Schulte and May’s data suggest that this is not entirely true – rather, it looks like the hypothalamus may be the true generator of migraine, while the brainstem could be a downstream mediator of the disorder. There are many unanswered questions with a one-person study, of course. Addressing the cause of this painful condition would find out when, where, and how a person’s hypothalamus became modified to express migraine tendencies. I’d guess that migraine tendencies may appear as early as the first trimester of pregnancy, given that a highly functional hypothalamus is needed for survival and development in our earliest lives. Gaining as much familial and historical information as possible from the person would be necessary steps in therapies that address migraine causes. As mentioned in How to cure the ultimate causes of migraines? comments are turned off for this post due to it somehow becoming a magnet for spammers. Readers can comment on that post instead.